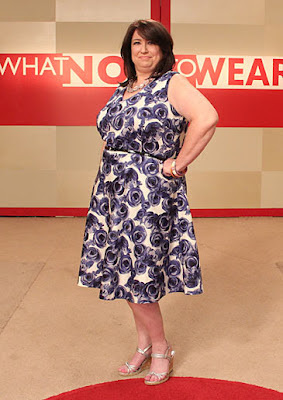 I confess that when I first saw promos for Kathy's makeover episode on "What Not to Wear," I thought to myself that I was glad they had finally decided to feature a woman in her 50s or 60s. Then the commercial revealed that Kathy was 45. I'm guessing a lot of home viewers were shocked at Kathy's age, but this was no mere lapse of style on her part. The episode revealed that this mom of three had not only survived a bout with cancer, but had lost her husband a little over a year ago. Stacy got choked up as she and Clinton talked with Kathy about her life, and how she hadn't made any time for herself because all she was focused on was being well for, and taking care of, her children. Our two favorite stylists let her know that her family now thought she deserved a little time and attention for herself. Going through Kathy's wardrobe didn't take much time. It consisted mostly of sweats and T-shirts, and what my mom refers to as "pumpkin sweatshirts." There seems to be an extraordinary amount of women in the U.S. who enjoy donning shapeless sweatshirts and tees with cartoon characters or holiday themes like pumpkins, Christmas trees, and snowmen. Into.the.trash! 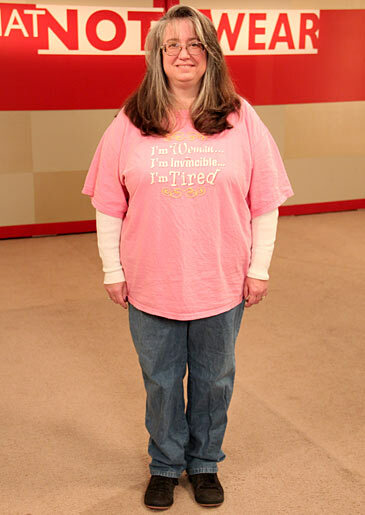 Like most women, Kathy didn't like her body shape, and felt comfortable hiding inside of big, baggy clothes. Shown a mannequin with a pretty print teal dress, Kathy protested, "But I'm 45!" I guess we have to blame fashion magazines and Hollywood for perpetuating the myth that you can only look good when you're 20, but it's still sad to see so many women who believe more than half of their life should be spent in "old lady" clothes. Stacy and Clinton assured Kathy that, while they didn't want her to be uncomfortable, they wanted her to try out a few different things to find a dress or outfit that made her feel pretty. They wanted to prove to her that being happy about herself would make those around her happy, too. Despite her claim that she was dreading the shopping trip, Kathy actually proved pretty savvy in finding clothes that fit and flattered her shape. The problem was that she still wasn't comfortable seeing herself as attractive, and so left things behind in the store that she felt had one tiny flaw or another. Stacy and Clinton later assured her that a dress with a gapping neckline (which it honestly didn't have) could be tacked with a bit of thread or fixed with a little cami underneath. While the clothes were a big shift, showing Kathy that her previous boxy shape could be transformed into a vavoomy hourglass, the hair and make-up pushed this over into one of the most stunning makeovers in "What Not to Wear" history. Once she had her dark hair and rosy make-up in place, Kathy looked like her own daughter. As she embraced her teen girls in the final reveal, you could finally see the resemblance between the mom and her children. Her whole posture and demeanor changed, and her perky personality came shining through. Friends and family were thrilled at Kathy's new look, and in her "What Not to Wear" video update, Kathy confessed that when she went to work, she was actually refused entrance because the person at the door didn't recognize her! This was one of "WNTW"'s finer episodes, that reached its loftier goal of transforming a woman's life through clothes--in a way that is about so much more than the clothes. Kathy learned how much her daughters love her and want her to be happy, and that rather than feel guilty about what her children have gone through, to be proud of how she's come through it all for them. I'm not sure how anyone could have watched this episode without shedding tears. Kathy was one of the sweetest makeover participants who had been dealt a lot of trauma in her life, and still managed to give everything to her children and to cancer charity work. Stacy and Clinton asked for extra hugs during the in-studio reveal; they were so happy to have worked with such a kind and deserving client. My only complaint about the episode was my usual "What Not to Wear" complaint. Gals with glasses always miraculously have 20/20 vision after their makeover. Kathy's glasses definitely needed an upgrade, and I was looking forward to seeing what modern frames they'd choose for her, but instead she just ditched the glasses like an ugly duckling-to-swan character in a romantic comedy. Not everyone out there can wear contacts or have eye surgery, and getting glasses to fit your style and face shape can be a real style challenge. It's frustrating that "WNTW" most often deals with this issue by avoiding it completely. 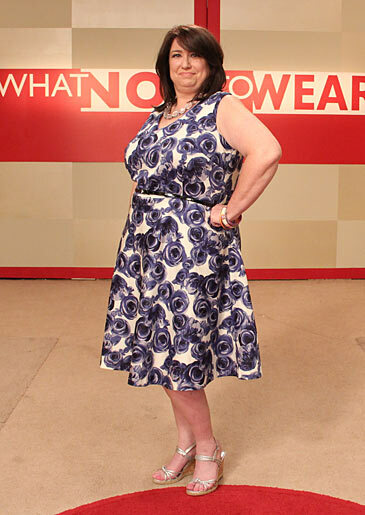 PHOTOS: Kathy, before and after, "What Not to Wear." c2012 TLC.